I’m treasurer and webmaster of a motorcycle club affiliated to the Institute of Advanced Motorists called Edinburgh and District Advanced Motorcyclists. The main aim of the club is to assist people with preparation towards an “Advanced” test that is run and administered by the IAM. 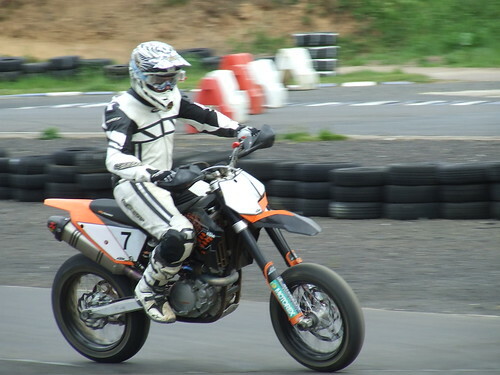 The idea is that Advanced training helps an individual to manage the risk of riding a motorcycle and try to avoid the situations that result in accident. The club also tries to do things for those that have passed the test and some of us had a run to Arran last Sunday. The run there was a bit boring, but the island itself (at the end of a short ferry crossing) is absolutely beautiful. Unfortunately I’m not sure I can recommend it as a destination for motorcyclists as the roads are in pretty bad condition, with edges falling away, potholes and gravel. I’ve got pictures on Flickr, and videos going up on YouTube.